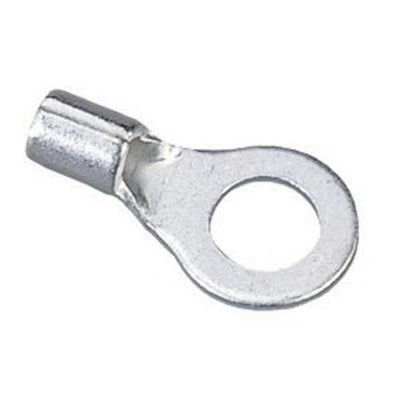 Ideal Industries 83 Series non-insulated ring terminal in tin-plated finish, has brass construction for better corrosion resistance. The butted seam eliminates splitting under great pressure. The ring terminal with 10-Inch stud, accommodates 6-AWG conductor. The voltage rating of this terminal is 600-Volts. Helps in better and secure positioning of wires through internal barrel serrations. It has expanded insulation entry to allow entry for different insulation diameters. The ring terminal is Cu and UL listed.